How the Democrats can get Bernie to stand down. Don’t hector him. Help him. Sen. Bernie Sanders speaks to supporters at a primary night rally on Tuesday in Santa Monica, California. Hillary Clinton ultimately won the state contest. The wishful thinking among Democratic Party leaders is that Bernie Sanders has come to terms with his loss and is just scouring the map for an appropriate exit ramp. This is what, say, President Obama would like to hear when the two meet on Thursday. The other possibility, which Washington politicos struggle to grasp because it involves a politician actually meaning what he’s been saying in public, is that Sanders is serious about spending the remainder of the pre-convention period arguing his case against Hillary Clinton to superdelegates in a doomed attempt at persuasion that postpones, or eliminates, the intraparty healing process. 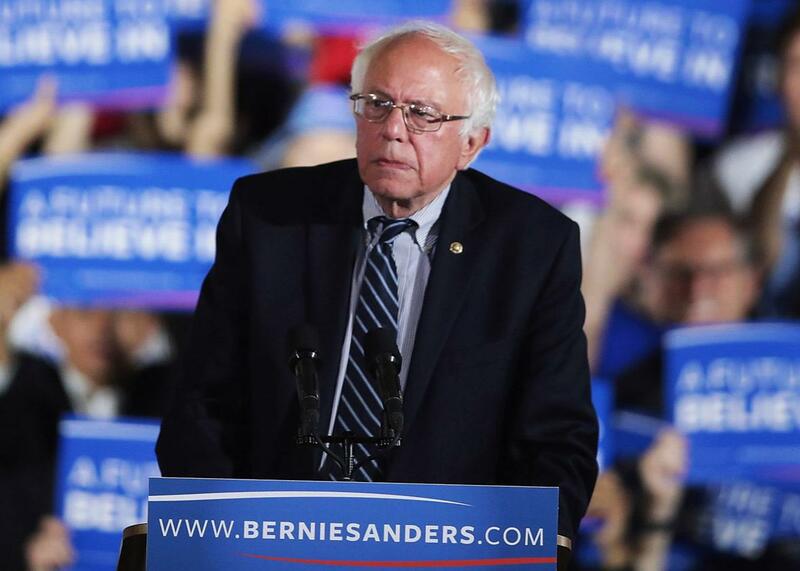 If Sanders does intend to continue pursuing the nomination in such an abrasive way—falsely building up hope among his most die-hard supporters up to and through a convention clash in Philadelphia—party leaders are going to have to reach him in another way beyond hectoring. Pointing to the numbers won’t work for the simple reason that if they haven’t already, they’re never going to. Worse, there’s reason to believe Sanders only interprets such number-pointing as condescending and disrespectful to what he’s built, which makes him more inclined to continue his path toward mutually assured destruction. Telling Sanders he’s lost and needs to go away wouldn’t do the trick—no matter how many times it’s said. So the way to get him out of the picture would be to show how exiting the race is really his only means of “winning” in the sense of translating his campaign and its aspirations into something more enduring. The Politico piece can’t be treated as unvarnished truth: Though it has on-the-record quotes from certain principals, you can never be sure who leaked (and thus framed) the most odious bits and for what reason. That’s more a criticism of the genre. This piece in particular, though, doesn’t seem to acknowledge that Sanders might have real policy objections with the mainstream Democratic Party, and that his main concern is those objections will disappear from popular conversation the minute he drops out of the picture. Sure, maybe the relative closeness of the race made him power-hungry in a way that it would just about any human in his position, and that led to some unflattering moments. Sanders “likes that he’s been in front of almost a million people since the campaign started,” Politico writes. “But he knows that as soon as the campaign’s done, the crowds will start thinning, and he’s not going to get on television anymore.” This is written in a way that portrays Sanders’ quest as purely vain. It could be—could be!—that Sanders is less worried about his beautiful mug appearing on television each day and more worried about whether the ideas he introduced to the Democratic debate will vanish once he’s gone. The best approach for those trying to talk him down—a group that’s expanding to include some of his top surrogates—is not to keep badgering him about how he lost, and needs to concede, and then campaign unconditionally for Hillary Clinton. This will only fuel resentment that he’s not being treated respectfully. Instead, the first question President Obama and others should ask Sanders while meeting him is: What can we do to help ensure your movement doesn’t disappear? The Sanders camp has already been fighting over the Democratic platform, the drafters of which held their first meeting Wednesday in Washington. That’s part of it. But Sanders is no dupe, and knows that the platform will just be sealed and crated off to some vast warehouse Raiders of the Lost Ark style if there’s no organization left to actualize the policies he fought to include in it. Obama could offer to do everything in his power—not as president, but as a popular and well-connected Democrat—to help set up Sanders with a permanent infrastructure for his movement, an Organizing for America–type pressure group. (One that, unlike Organizing for America, wouldn’t have to subordinate its pressure activities to the political prerogatives of the Oval Office.) Or something else? Be creative! Democrats see Sanders as a stubborn pest at this point, but they can’t just wish him away. They might as well give empathy a go. Sanders has won more than 10 million votes, is too old to run again, and is worried that everything he fought for—and everything that attracted the next generation of voters—will be forgotten as Clinton tacks rightward. That’s the level where he needs to be met. Dropping out right now is a win for Clinton and a loss for himself. Staying in through the convention and refusing to concede would be a loss for Clinton and a loss for himself. There’s no reason some arrangement can’t be struck to make this a win-win, with Clinton unifying the party and Sanders’ movement securing the future.